Transcribing popular music is largely a behind-the-scenes affair. While not completely anonymous—I usually get a byline—the artists whose intellectual property I render into sheet music receive the praise and credit for their art and really, that's the way it should be and I'm fine with that. Occasionally, however, I do receive correspondence from a reader or musician whom I don't know, and I'm always humbled when it happens. Ben Frankis: Have you received formal music training, if so what? David Stocker: The first formal training I received was in a Classical Guitar class I took in 7th Grade. After I moved to Central Virginia with my family in '89, I was mostly self-taught. By 'self taught', I mean that I spent hours upon hours in my room learning by ear (I didn't realize it at the time, but these would prove to be my formative years—learning by rote the songs and techniques of my favorite guitarists). In my Senior Year at High School, I took a Music Theory class (the only formal music class I took between Middle School and College). Throughout High School and College, I played in bands in the Richmond area. After High School, I began studies at Virginia Commonwealth University's School of Music, where I eventually earned a Bachelor of Music degree in Classical Guitar Performance. In that time, I also studied Piano, Jazz Guitar, Music Theory and Music History (as well as Philosophy and Religion). I graduated in 1998. After VCU, I spent about 18 mo. at Arizona State University studying Music Education. Ultimately, I settled on music publishing and discontinued my studies. BF: How did you start to transcribe professionally? DS: In the Spring of 2001, while I was teaching private guitar lessons, I started emailing editors of guitar magazines, inquiring about working as a freelance transcriber. I had always been able to learn recorded music by careful listening and experimentation, and so was confident in my ability to do it for work. After sending in samples of transcriptions and getting some feedback from editors, I began to receive assignments from publishers. BF: Do you use any software or tools to help you work out a piece of music and/or to notate it, if so what? DS: I use a program called Transcribe! to assist in the work of transcribing. The program allows you to slow down recordings, isolate right or left channels, loop sections of the recording and has a number of other useful features. Most of my transcriptions are hand-written. When I do engravings, I use Finale, Sibelius or LilyPond depending on the client. I recommend LilyPond to clients, especially for Classical music engravings because of the high quality output it produces. BF: Do you have a set process when transcribing? DS: When I start on a transcription, the first thing I do is load the sound file in Transcribe! Then, I listen to the entire track 2 times through. 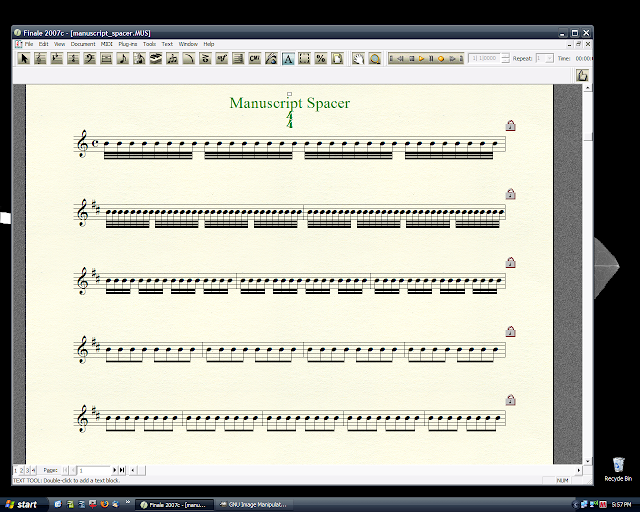 On the third pass, I start adding markers and text blocks to the transcription file. The markers help me to navigate through different sections of the song quickly. I use the text blocks to label sections and add details about what is happening with the music, like what instruments are playing and when they come in, their orientation in the stereo image, etc. BF: To what extent should a guitarist be stylistically and technically proficient if they want to work as a professional transcriber? DS: It's important to know the range of the guitar and be familiar with the various tunings modern guitarists are using. I'd estimate that about 1/2 to 2/3 of all the music I transcribe is in some derivative of standard tuning. The rest is in something else, mostly Drop D, but there are several others that pop up now and then—open tunings, DADGAD or what have you. Open tunings are especially prominent in styles where there is a lot of slide playing like in Blues or American Country music. A working knowledge of various guitar techniques—picking styles, harmonics, fingerstyle, capo usage, etc.—is essential. It's also good to have experience with the various effects and signal processors in wide usage today. A good grasp of Music Theory is also important. Most of the music I transcribe is in traditional "guitar keys" like A, E and D minor or C, G, A, D or E major. Occasionally you get something less common like B major or G minor, so it's good to be flexible and to be able to think in all keys. Having some knowledge of modern studio recording techniques is a plus. As for styles, the most important thing is to approach new music with the mind of a beginner and not to assume too much from the outset. It's critical that you can identify and reproduce the sounds you hear on a recording. Usually, the technical aspects of a given style are readily apparent, but that's not always the case. Nailing down techniques in a style that you're unfamiliar with often means doing some research, which usually means watching video of live performances. BF: What do you consider to be the most important skills required in transcribing? DS: Being able to cut through effects and draw out the notes. Listening for tone differences and being able to identify by sound what kind of instrument someone is playing and what kinds of effects they're using. Fluency with music notation and terminology. And of course, technical proficiency on the instrument you're transcribing for. BF: What advice do you have for someone pursuing a career as a professional transcriber? DS: Learn to play a lot of music by listening to it. Strive to emulate your favorite players and styles, but also, don't be afraid of trying something new now and then. Become a proficient sight-reader. BF: Why do think you have been able to have a successful career transcribing? DS: I've been successful because I don't let go of a transcription until I know I've done everything I can to make it the best that I possibly can. My process is under a continual process of refinement. I like to try new things and I've learned to keep what works and shed what doesn't. I also have a policy of total honesty with my clients with regard to deadlines and my own capabilities. Potential employers appreciate when you're honest with them, even when sometimes you just want to tell them what they want to hear in order to get the job. In a real work environment, where there are real deadlines, it's important to be realistic about work quality and time frames, so that the ones who are depending on you can in turn be depended upon. Over the years, I've received several compliments from editors on the neatness and clarity of my manuscripts. I take pride in that because, next to accuracy and timeliness, clarity of intent is the next most important attribute of a transcriber's work. A manuscript that is free of clutter and has proportionately spaced and properly aligned text and music elements is easier for editors and proofers to read. Neatness minimizes misunderstandings and makes it easier to spot mistakes. During the time I've spent writing transcriptions, I've been able to develop tools and techniques that enable me to write a clean, clear manuscript with relative ease in a shorter amount of time. In this installment, I'm going to share some of the habits I've learned and developed that have made writing clean and neat manuscripts one of the easiest parts of my transcription routine. I'll reveal tools that everyone—amateurs, students and professionals—can customize and use to improve the look and clarity of their work. I'll also cite some handy references for those who might want to study further the history and practice of music notation, from which I draw the foundations of my manuscript style. When you're done formatting your Manuscript Spacer, print it off and fold it up. You should fold the paper along the “B” line of each staff. Mine has 5 folds. I use the edge of a paper cutter, but if you don't have a cutter around, you can use the sharp corner of a table or counter top to make your folds. Then, use your thumb (or a burnishing tool) to make the crease. If you want, use clear packing tape to reinforce each of the creases. You can use scissors or a paper cutter to cut the edges even so that no tape is hanging off. 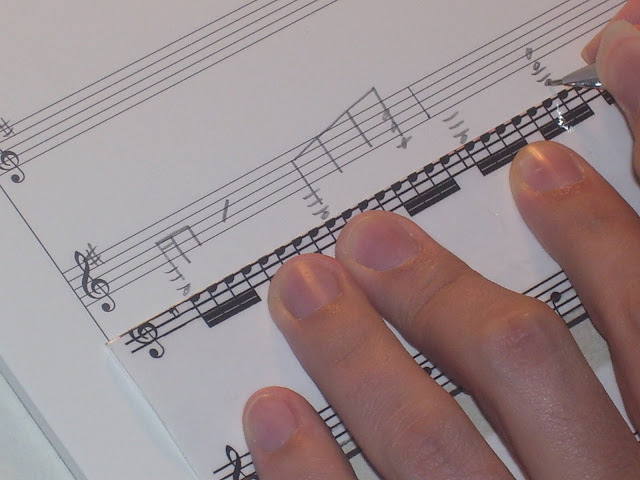 Now, you have a custom-made Manuscript Spacer that you can use to align all of the elements of your hand-written music. For writing notes, chord symbols and most other music elements (like dynamic markings), I use the 0.9mm mechanical pencil. It draws nice bold lines which easily stand out against the lines of manuscript paper. 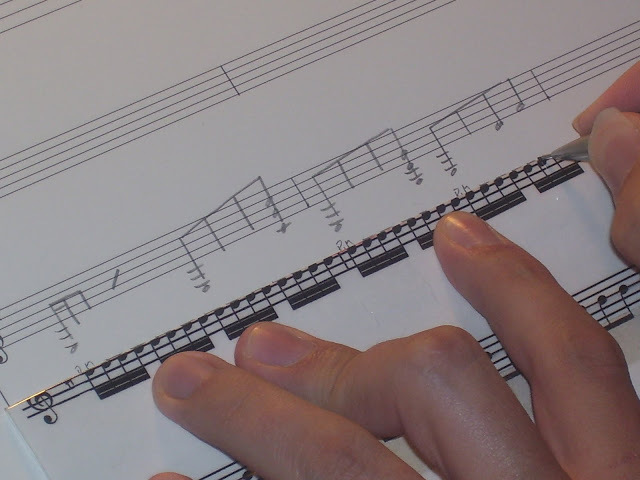 I find the music easier to read at that weight, since it is mostly within and intersects the staff lines of the paper. I use the lighter weight pencil for most text elements (like lyrics and directions) because it allows me to write smaller with greater legibility. The ruler and T-square are for any straight lines like bar lines, repeat endings or hairpin crescendos and decrescendos. 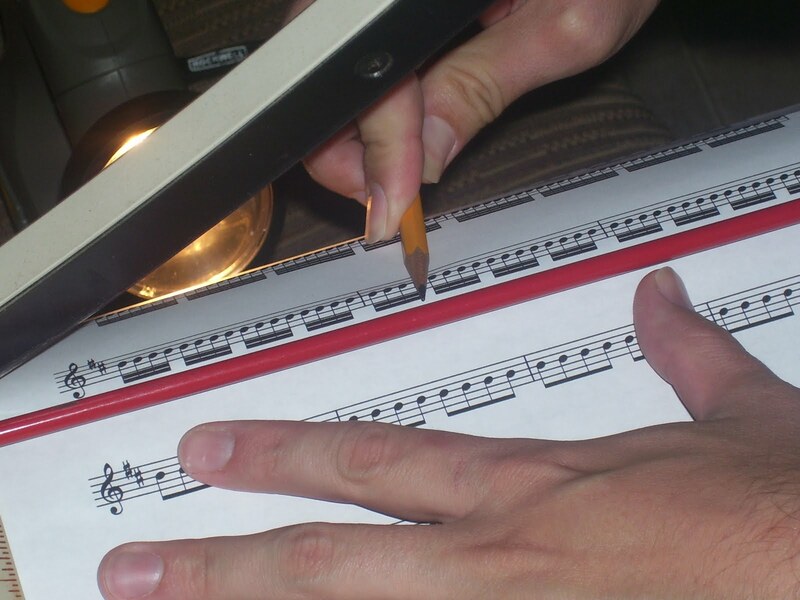 These are things that almost anyone who hand-writes music is familiar with. When I'm ready to write a section of music, the first thing I do is make a decision about measure width. I always strive to fit as much music on a line as I comfortably can. Taking all of the musical elements into account when making this decision—notes, accidentals, lyrics, density of chord changes, tab numbers (if present), and of course, overall layout considerations (how many staves per line)—will prevent frustration as you go along. When I've determined the optimal measure width, I use the Manuscript Spacer to mark off the bar line positions and the ruler (or T-square) and 0.9mm pencil to draw the bar lines. At this point, I'm ready to start writing the music. 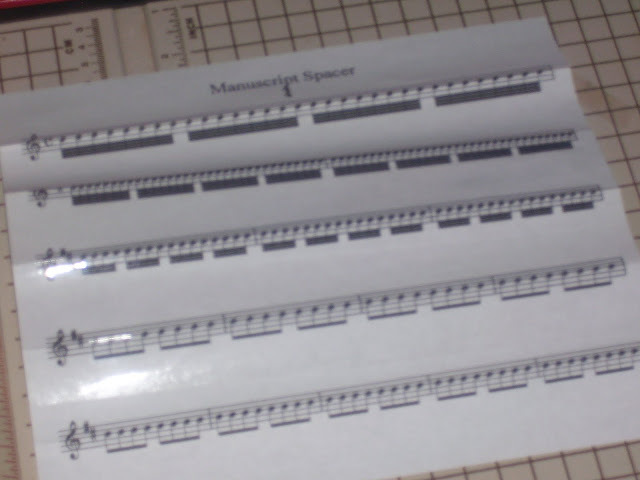 Once the bar lines are marked, spacing the notes using the Manuscript Spacer is a breeze. I simply align the Spacer's bar lines with the bar lines I've already drawn and then start writing the music, using the Spacer to align notes and rests. I do this for each instrument and voice in the texture. Pretty soon, I have a page full of music and I'm ready to begin adding any text elements like lyrics and directions to the score. I use my 0.5mm pencil with the Spacer to align any lyrics and in-staff text indications (like ottava directions and certain articulations) to the staves. The reinforced crease is good to use as a straight edge for drawing lyric extenders and line spanners. Then it's time to add chord symbols, out-of-staff text indications (like recalls of labeled figures) and section headings or rehearsal marks. I prefer the 0.9mm lead for chord symbols and headings and the 0.5mm for almost all other text. You can see that with a minimum of extra effort, a free-hand manuscript can be beautifully spaced, and elements precisely aligned. 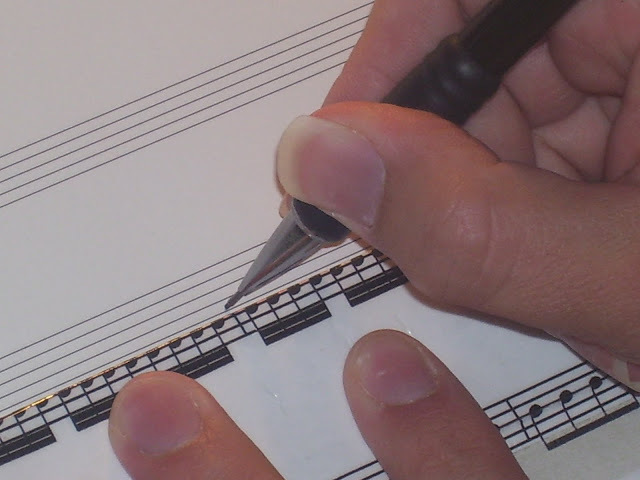 Whether you're writing sketches for band rehearsals, music for yourself to remember, music theory assignments or preparing scores for professional engraving and publication, using the Manuscript Spacer can help you write clear and legible music that will earn the appreciation of anyone who has to read it later.